This script adds a mouse over preview of the current row in a floating DIV. It is related to the script Preview metadata in list view on mouseover, but is simpler as it does only wrap up the content of the current row. Save this as a file – name it “mouseOverWrapRowTableStyle.js”, and upload it to your script library as shown above. Is it possible to show all fields of the item, rather than just the columns that are included with the view? Hi there, Will this work if list is on a different subsites or sites.. This article describes a solution for wrapping up the current row only. I’m working on a project right now, and I found your solution very helpful. The thing is that my client ask me to perview other list items in the preview pop up. I found your other solution “Preview metadata in list view on mouseover” but the problem is that my client wants the pop up table design of this solution. My question is : Is it possible to change the design of the metadata solution to the design of this tool (Show current row) ? I’m not quite sure what you mean. 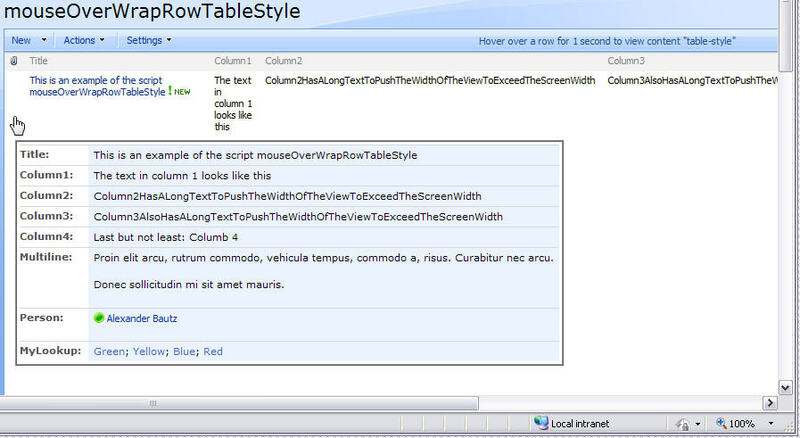 If you preview the full DispForm, the layout is “table style”. What do you mean by “to perview other list items”?